We’re living in a strange new reality in the United States. Our citizens are forced to deal with problems such as terrorist attacks that never happened (e.g. Bowling Green, KY) and life-saving vaccines causing problems that they don’t. A large percentage of the population is happy to accept lies and contradictions without question. Alternate facts seem to be accepted in more places than MasterCard, Visa, and Discover combined. 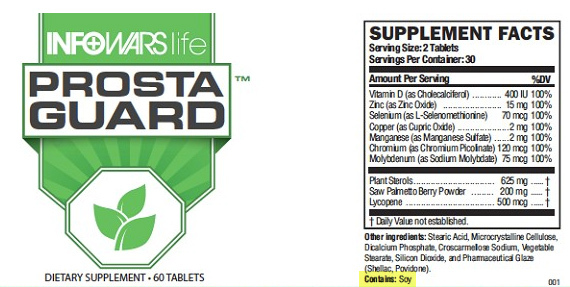 The soy in question is found in a men’s health supplement named Prosta Guard,2 sold by Jones’ InfoWarsShop.com. Knowing that nearly all soy grown in the United States is genetically modified3 and painfully aware of Jones’ “America First” attitude, I contacted the InfoWars store and asked if the soy used in this product was genetically modified. The response, was, unsurprisingly, “Yes.” InfoWars customer service added that any non-GMO products sold by Jones’ haberdashery would be clearly marked. I don’t give a tinker’s damn if the soy is genetically modified or not, and experts agree that consumers have no reason to be concerned either. There’s no evidence that genetically modified foods are anything but safe, nutritious, and a boon to agriculture. But arguing the point with conspiracy theorists is an exercise in futility. Consider, if you will, that Alex Jones believes that the government uses chemicals to create homosexuals as a form of population control, Michelle Obama is a man who married Barrack to prove a point on transgender rights, the United States Government has a secret weather control machine, and the “new world order” is opening thousands of portals to allow demons to pour out onto Earth.4,5 How do you debunk a reasoned argument when one is never presented? Irony of ironies, InfoWars also spreads fear and paranoia about food-based chemicals believed to disrupt the human endocrine system.6 Yet they completely ignore the fact that the soy in their Prosta Guard contains naturally occurring compounds known as phytoestrogens, which are (wait for it)… endocrine disruptors. Alison Bernstein, who runs the outstanding science page Mommy PhD, authored an excellent article7 on endocrine-disrupting chemical (EDC) science and associated paranoia. Using soy as one example, Bernstein expertly picks apart the Appeal to Nature fallacy displayed by those such as Alex Jones, who eschew BPA food containers only to consume the very class of chemicals they’re trying to avoid. In his blatant act of marketing hypocrisy, Mr. Jones joins a host of other hucksters whose scholarly and ethical compasses arguably don’t exactly point north. For over three years, anti-GMO campaigner Vani “the Food Babe” Hari has sold a skin care product made with GMO corn despite warning that the “toxic” ingredients can be absorbed by the skin and into the bloodstream. Mike “the Health Ranger” Adams of NaturalNews.com peddles wares containing GMOS here, here, and here, even though his web site contains over twenty pages of search results falsely linking GMOs from everything to cancer to farmer suicides to the destruction of agriculture in Africa. Jones’ followers stare at his hypocrisy like a deer in headlights, blissfully ignoring the truckload of truth bearing down on them, a blaring horn of facts trying to warn them off the roadway. It’s a scene growing ever more common in a country that once took pride in science, reason, and truth. There’s nothing to fear from the GMO soy in the Prosta Guard sold by the InfoWars store, but many reasons to avoid funding the store’s owner, who spreads dangerous anti-vaccine propaganda that endangers public public health. Buy Prosta Guard if you must. Just please don’t buy it from Alex Jones. Alex Jones pep band parody image by Mark Alsip/Bad Science Debunked uses elements from Hormel, Alex Jones/InfoWars, and YouTube under provisions of Title 17 U.S.C. Section 107, commonly known as “fair use law”. This material is distributed without profit with the intent to provide commentary, review, education, parody, and increase public health knowledge. 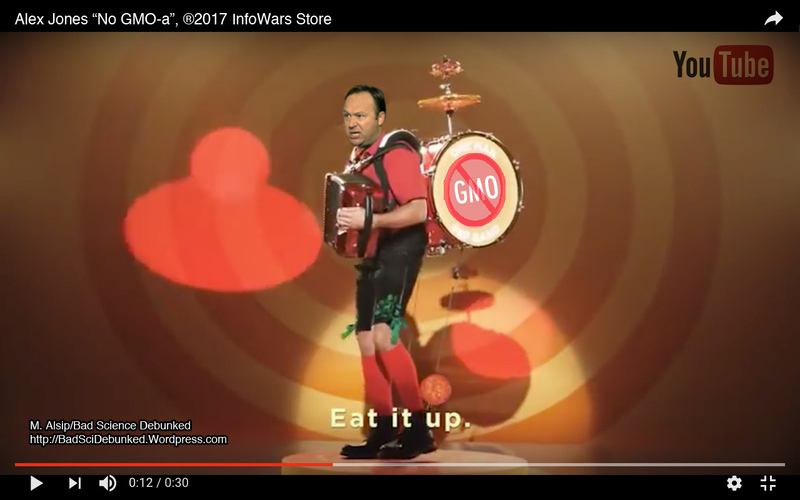 Alex Jones/InfoWar screen captures used in compliance with Title 17 U.S.C. Section 107, commonly known as “fair use law”. This material is distributed without profit with the intent to provide commentary, review, education, parody, and increase public health knowledge. This article was modified on March 28, 2017, to reference material from “A Chemical is a Chemical is a Chemical”.